It’s hot! Thank goodness for books and air conditioning. Here’s what I’ve been reading. 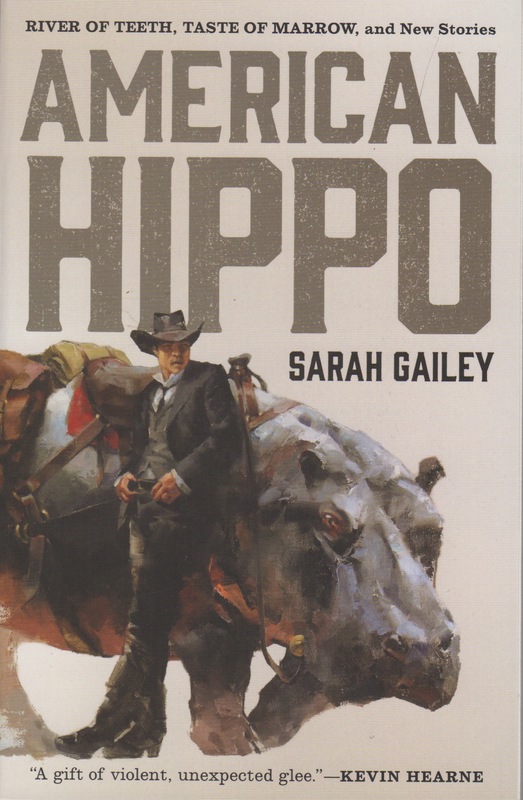 River of Teeth, and Taste of Marrow by Sarah Gailey collected in American Hippo. Fantasy. These are two novelettes (perhaps novellas, not positive about the word count) set in a fictional south in which hippopotamuses have been brought into the swamps of Louisiana to be ranched and raised for meat. Of course things go awry. But the book is full of wonderful characters and the setting is unique and well-drawn. I liked these both a lot. The author’s next book doesn’t carry on with these characters, but I can hope for more of this in the future. Recommended. Worldmakers edited by Gardner Dozois. Science Fiction. This was my Friday Forgotten Book two weeks ago, so no more need be said. 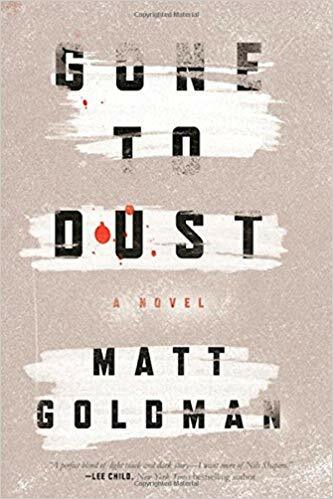 Gone to Dust by Matt Goldman. Mystery. Set in Minnesota, this is a debut private eye murder mystery from Emmy Award-winning Seinfeld writer Matt Goldman. The crime scene, the house of the murdered woman, is thickly cover with vacuum clear dust. Impossible to pick up any prints, DNA or clues to who slipped into the house and cut the throat of a much-liked suburban divorcee Maggie Somerville while she slept. Private detective Nils Shapiro has no cases and is spending time trying to forget his ex-wife and making a living. He’s glad to get a call from old friend Anders Ellegaard, who is a Police Detective for the nearby City of Edina. Ellegaard wants Nils to find clues where it seems none can exist. But Nils finds phone records leading to more than one suspect before the FBI steps in to order a halt to the investigation. Why? Nils and Ellegaard are forced to take their investigation underground, where the case grows less clear as the weather worsens. I thought this was a pretty good one. Too dark for me, Patti. I’d think you might want something lighter, all things considered, but I know you like this stuff. I started Gailey’s first HIPPO book but I had a bunch of other stuff lined up and it didn’t immediately grab me in a “you need to read this now” manner, so I returned it. Maybe if I am in that mood I will try it again. When I see a book described as “unrelentingly dark” (EILEEN), I pass it by..
I’m reading the second collection of stories about Harry Dresden (mostly) by Jim Butcher, BRIEF CASES. I enjoyed the three Bigfoot-related stories (I know Bill Crider would have enjoyed them), and I’m finding them all to be fast-moving and entertaining. Also reading THE SHERLOCK HOLMES STORIES OF EDWARD D. HOCH. So far, OK but nowhere near his best work. I finished Chekhov’s A NIGHT IN THE CEMETERY And Other Stories this week too. Other reading this week: THUNDERHEAD by Neal Shusterman, his sequel to SCYTHE, sort of a dystopian YA set in a future where there is almost no death, other than sanctioned killings by Scythes. GOING INTO TOWN: A LOVE LETTER TO NEW YORK is almost self-explanatory. It is Roz Chast’s graphic tribute/introduction to her hometown. The only quibble: those of us who grew up in the Outer Boroughs called trips to Manhattan “going to the city” rather than her title. I raced through it, enjoying it a lot. Lastly was the latest Amish mystery about Police Chief Kate Burkholder by Linda Castillo, A GATHERING OF SECRETS. I wonder how any Amish who read these books feels about her depiction of their society. She sure has a lot of murders in her books, but I find them all to be very fast and entertaining reads. Next up may be the new Megan Abbott book. I caught the typo in the post title. I liked the Gailey book, it really clicked with me. Read each of the novelettes in a day, which is good for me. I’m reading one now by Bill Bryson I bet you’d like, and have undoubtedly read: Notes From a Small Island. The Roz Chast book sounds good. I’ll see if the library has it. Loved NOTES FROM A SMALL ISLAND. That and his first US book – THE LOST CONTINENT: Travels in Small-Town America – remain my favorites of his books. I’m reading The Road to Little Dribbling now. Not sure if it’s wise to read the two books back to back. The Chaz book is available, as an ebook, I’m 3rd in line. Since most people have no idea how to return an ebook, they just let it run out at the end of three weeks. Thus it will likely be at least six weeks before I can get it. I suggested the library put instructions for returning ebooks on their website, but nothing has happened. As soon as we finish an ebook from the library I go on Amazon and return it. Only a couple of times have I gone the limit, and both times I guess no one else was waiting for the book, as I was able to keep it the one extra day I needed to finish it. Jeff – That’s what I do with ebooks too. But apparently most people don’t know how to go to the Outlook or library page (for Android ebooks) or Amazon for Kindle and do that. It usually takes me three days or so to read an ebook, and I return it. Usually I have to wait the full 3 weeks if I’m in line, so obviously others are to ignorant or lazy. I picked up the new VINYL DETECTIVE volume, VICTORY DISC. I’ve enjoyed the first two books in this series. My goal remains to whittle down my Read Real Soon stack by reading books that I’ve had for years. I didn’t buy anything during AMAZON’s PRIME DAY. I read the first one, but not the second. Prime Day – I didn’t either, George. I gotta’ love that Hippo cover. Not sure about the book. But I think I’ll take a look at GONE TO DUST, Rick. I’ve lately been reading old mysteries and a few romances, just giving my brain a rest I suppose. Ha. Haven’t read anything contemporary in a while. Next up: more than likely THE THREE MUSKETEERS, a copy of which I picked up in an used book store recently. I’ve been reading George Bellairs mysteries one after the other and enjoying them. Reading some happy ending romances too, just because. Trying to avoid the reality of the world out there. Got some interesting biographies lined up too. I got that Ballairs book, your most recent review, for Kindle but it may take a few weeks to get to it. Yes the reality of the world, and especially the Trump administration, is hard to take. Really enjoyed Gailey’s novellas when I read them. The fact that the whole idea is based on a real plan is just insane. Imagine if they had gone through with it. Yes, imagine. I was disappointed to learn her next book isn’t part of this series. It’s been a hectic week here, Rick, and most of my reading has been limited to various short stories from previously unfinished collections and anthologies that had been hanging around here forever, so I was able to (finally) finish the following: A DREAMER’S TALES and TALES OF THREE HEMISPHERES (both fantasy collections by Lord Dunsany), TALES OF TERROR (a horror anthology edited by Kurt Singer), A QUIVER OF HORROR (edited by Dennis Wheatly), and A YEAR AFTER TOMORROW (edited by Lester del Rey, Cecile Matshak, and Carl Carmer — and the only anthology in the Winston “Adventures in Science Fiction” juvenile — this was pre-YA as a category — series). Two-thirds of the stories in THE YEAR AFTER TOMORROW came from AMERICAN BOY magazine going as far back as the 1931; They include two novels by Carl Claudy, THE MASTER MINDS OF MARS (published in novel from as THE MYSTERY MEN OF MARS) and THE LAND OF NO SHADOW; the last is probably an abridgement or an except, although I don’t have the hardcover book available to compare. My other reading this week included EASY DEATH (a top-notch crime novel from “Daniel Boyd”), Sax Rohmer’s fantasy/mystery THE GREEN EYES OF BAST (my FFB this week), and THE SCHEME OF THINGS (a SF novel ghost-written by Paul W. Fairman for Lester del Rey — this one started somewhat cheesy but soon morphed into an interesting read). I topped off the week with three graphic novels: Colin Bunn and Sergio Devila’s CONAN THE SLAYER: BLOOD IN HIS WAKE (better than I thought it would be) and Volumes Two and Three of Ed Brubaker and Sean Phillips’ CRIMINAL (both excellent; I’ll be reading more of this series!). Coming up I have a passel of short stories lurking in books by Poul Anderson, Eric Frank Russell, and other that have found their to the top of Mount TBR. I also picked up from the library Leslie Klinger’s ANNOTATED FRANKENSTEIN, which sounds like fun. Keep that AC churning and stay out of the heat, my friend. I absolutely loved the Winston “Adventures in Science Fiction” series, and borrowed every one the library had. Just opening the books with that great illustration on the pasteboards was a thrill. I’m sure I read A YEAR AFTER TOMORROW. I like just about anything Ed Brubaker does. I’ll have to find CRIMINAL. Yes, the air is churning. It’s 96 now at 5:10 pm and may not turn the corner for another hour. We’ll be running the AC all night, same as last night. Darn. The mornings are so nice, but then old Mr. Sun gets carried away. Really, really hot today, and we had arborists here to trim trees, so lots of shade plants are not in full 98 degree sun. Darn. I also enjoyed Gone to Dust. Also the sequel Broken Ice which came out a couple weeks ago. Read and enjoyed Magpie Murders by Anthony Horowitz and The Anomaly by Michael Rutgers which is a pseudonym for Michael Marshall Smith who wrote the wonderful Straw Men a few years back. Half way thru the new Dan Fesperman-Safe Houses which is very good so far. Fesperman is a much underrated writer. Read some Bill Bryson a decade or so ago. I esp liked the one about Australia. I may have learned about Gone to Dust from you, Steve. I’ll look for Broken Ice. I didn’t realize it was out. Thanks! I’m not familiar with Fesperman, but I’ll check him out. I have that Horowitz on hold at the library, but it’s a long queue.